The card says it all! Hello Friends!! Last week in the store we got a new Pazzle Inspiration Electronic Creative Cutter, WOW is that a mouth full! Anyway it hooks up to your computer, no cartridges, and you can cut whatever your heart desires! 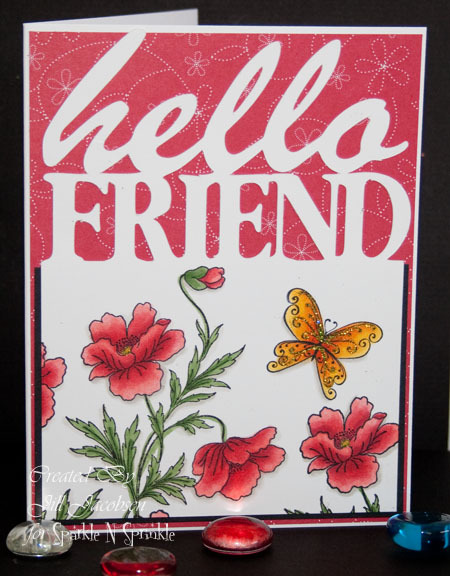 So I was just playing around with it and created this card front piece to stamp in. I stamped the poppies and butterflies and colored with Copics. It was a pretty simple card, but I love the effect of the cut out sentiment! Sparkle N Sprinkle will be selling the Pazzle very soon, so keep watching!